The marinade for this recipe really makes it authentic. I suggest asking your butcher to cut you a slab piece from a brand beef. You can also use rib eye or flank steak. Heat cast iron pot on medium-high heat. Place garlic cloves in the pot and toast until skins are blackened and soft. Remove from heat and let them cool. Peel the skins off and set aside. In a medium bowl, using two forks smash together the garlic and the chiles. Stir in the olive oil, lime juice, oregano, and salt. Rub the marinade on both sides of the meat and cover for 30 minutes. If preparing for later use refrigerate and then bring to room temperature before grilling. Prepare a gas grill on high heat. Place the meat on the grill and cook for about 7 minutes per side. Meat will be nicely browned on the inside and medium-rare inside. Remove from grill and cover loosely with aluminum foil and let it rest for 5 minutes. Transfer to a cutting board and thinly slice. Serve with black beans, guacamole, shredded cheese, sour cream, and flour tortillas. 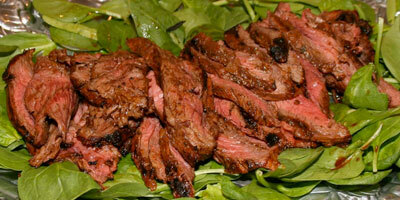 *Meat can be marinated one day ahead and brought to room temperature before grilling.